>> Note about "the outskirts" : the author is right to say this, since Les machines, and before them the shipyards (les chantiers navals) were in the faubourgs / quartiers périphériques -- neither the suburbs (banlieue) nor the city centre. This is a store on rue Daguerre in south Paris. 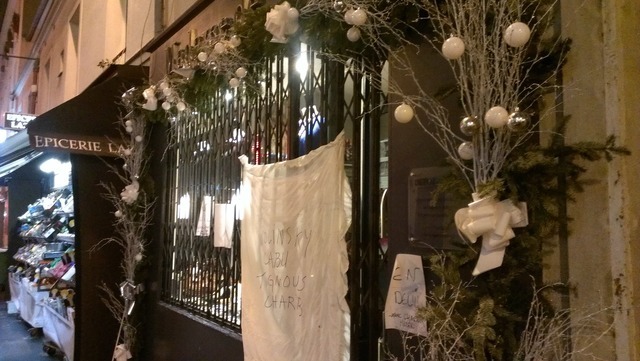 The signs bear the names of the victims and "en deuil avec Charlie Hebdo" (grieving with Charlie Hebdo).